Scan across the field both directions to observe what players are doing. Are they going forward or stopping and retreating? Don’t watch the ball – watch the players! Referees should run toward the direction of the kick but not toward the ball. Don’t head directly toward where the ball will land. Give yourself space to view what occurs. Penalise a player who was never onside before you penalise a player whose timing was off when chasing a kick. 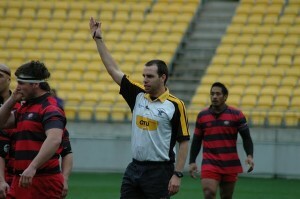 Being offside is judged in relation to where player’s feet are.